First, Tbilisi itself is a biased sample. All of the survey work so far has shown that Tbilisi residents are the more skeptical about the government than any other part of the country. 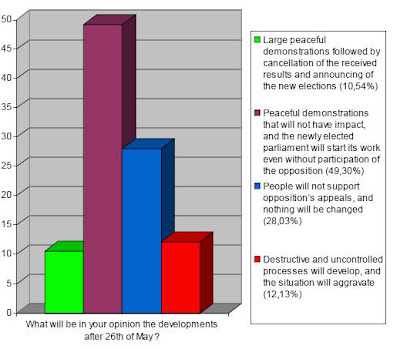 While the views of Tbilisi residents may matter in terms of who will demonstrate on the streets, it is not an accurate assessment of the mood of the country. Moreover, and this is a standard objection even if it's not familiar to people that don't know much about surveys, telephone surveys have limited reliability. You will only reach people that have a telephone, are at home (or willing to pick up calls from random strangers on their mobile), and who are willing to trust the interviewer and take some time to talk. Now obviously each of these four qualifications serve as a filter, and the people that actually respond may well not be very representative. As one saying goes, telephone surveys only get the views of those who are bored at home. Great for exploring some issues ("what television programming would you like to see? "), not for measuring attitudes towards complex political questions. Especially not in Georgia where there's little experience in weighting to counter the implicit bias. Then again, you could say that surveys like this only attempt to take the general mood, and that in the absence of funding for face-to-face interviews across the country, such a survey still gives us a quick glimpse. There is some merit to this view, but the problem is that reporting the views of 46.92%, with the precision of 0.92% tacked on, suggests a level of representativeness that this survey simply does not have. 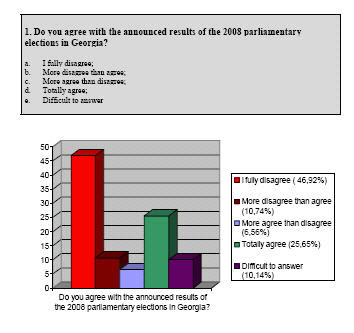 And there's another problem with the question: what exactly does "agreeing with the announced results of the 2008 parliamentary elections" mean? Did respondents like the results? Even if you voted for the winning party, you could fundamentally "disagree" with the results, since, knowing the final results, you would have preferred a lot more diversity in parliament. We ultimately just don't know what precisely "agreeing" means here. That's pretty much what happened in the meantime.